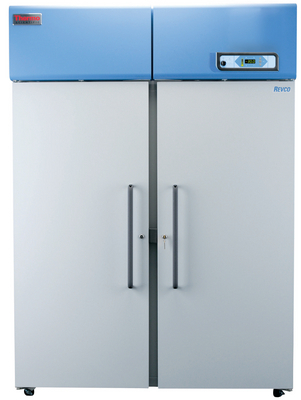 Revco® high-performance lab freezers have designed with micro processor control to achieve simplified operation with increased accuracy which is applicable for medical and scientific applications such as storage of reagents, pharmaceuticals, biologicals or other commonly used laboratory materials. A range of models offers cabinet sizes to fit your specific space needs and storage volume requirements, from undercounter units to full size models. Graphic thermometer is steady green when temperature is normal, flashes top bar for overtemperature, flashes bulb for undertemperature. Microprocessor Control system have designed with specifications such as audible/visual warnings for overtemperature, undertemperature, or power failure, key-operated OFF/ON/ALARM ON master switch for setpoint security, push-button alarm test, remote alarm contacts, alarm silence, ringback and auto reset, controller battery backup system. 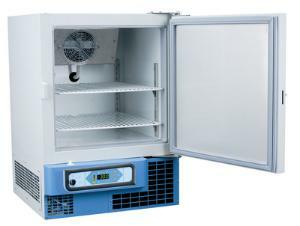 Freezers with −30 °C temperature preset offers automatic defrost and condensate removal, sensor automatically initiates defrost cycle on demand, eliminating need for a defrost timer, minimizing frost buildup, and optimizing coil efficiency, forced-air circulation improves temperature uniformity, provides faster recovery after door is opened. Freezers with −20 °C temperature preset are suitable for applications in which slight intermittent coil warming during an automatic defrost cycle is not desired (such as enzyme storage). Thsese freezer types are gravity convection air system which provides maximum stability without a blower or fan, manual defrost. Tilaustiedot: Alarm systems, temperature chart recorders and power monitors are available separately.